Welcome back to CASE-ing the Catty Sunday Blog Hop & HAPPY EASTER! I am sure you will be sick of chocolate by now & ready for our blog hop. We are sharing one last Sale-A-Bration project with you before it all ends. There are only a few days left to get your free Sale-A-Bration (SAB) items so you had better be quick! Remember, here in Australia, you need to order $90 worth of product to select those freebies! 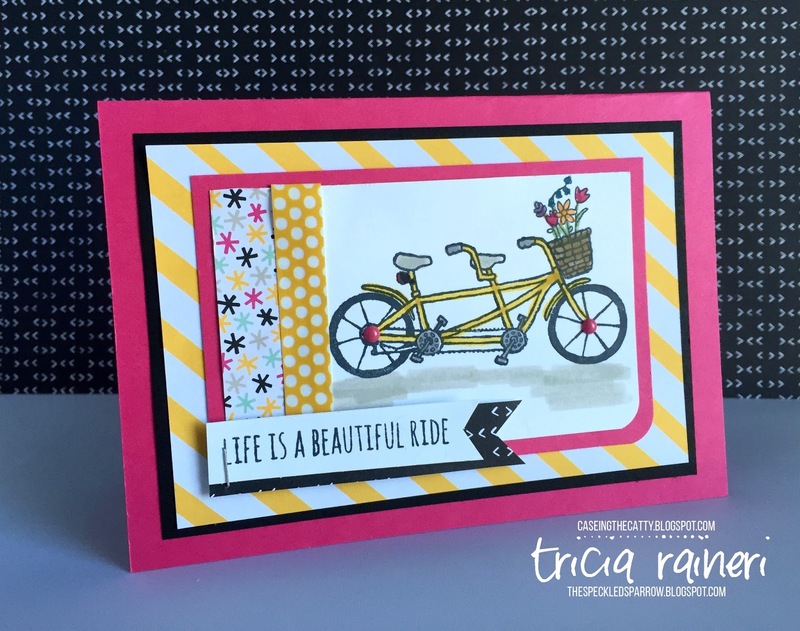 I loved this little bike when I first saw it & haven't had the chance to make anything with it until now. 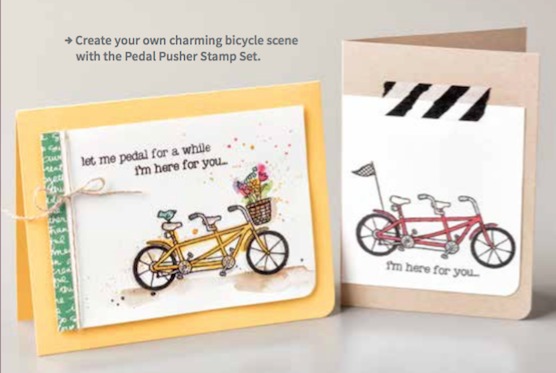 The Pedal Pusher stamp set has lots of little additions for the bike & different sentiments as well, making it a great choice for a free SAB item. I have been missing my bright colour palette so I have pulled out my favourite paper stack, Its My Party DSP stack. 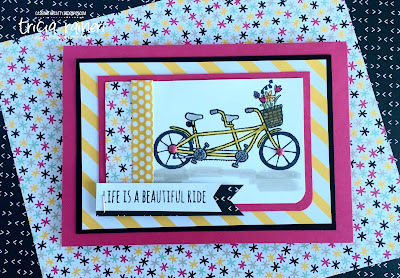 It has so many bright fun patterns & I just couldn't go past adding some coordinating products. 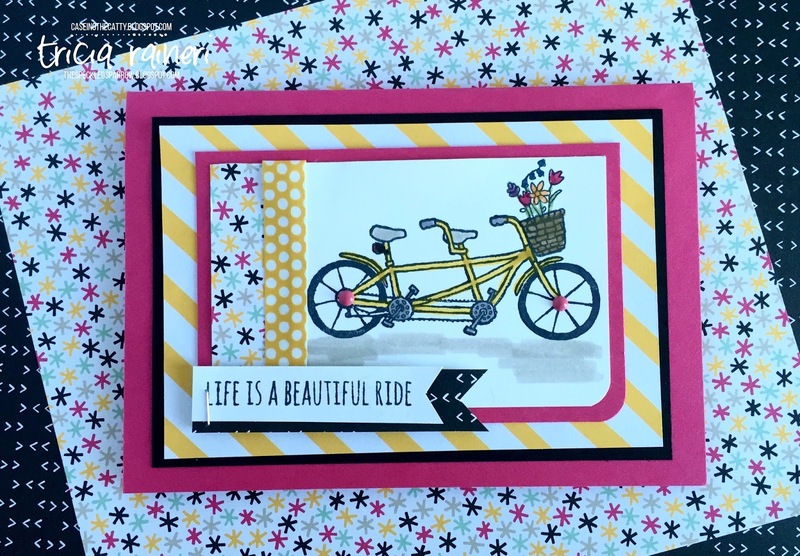 I added a strip of the Crushed Curry spotty Washi Tape & the Melon Mambo Enamel Dots to the wheels. All the other DSP is part of the It's My Party paper stack, which comes in a 12" x 12" size - perfect for scrapbookers! This is a great stamp to colour in with the Stampin Write Markers. Colouring in is fun don't you think? You could also water colour it like the sample I cased. 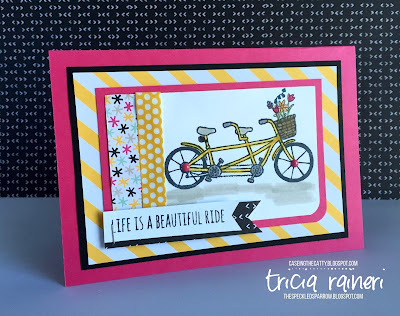 I used Beautiful Ride stamp set for the sentiment as I thought it went perfectly with the bike. Would you like to earn Pedal Pusher for free? You have until the end of March to get that qualifying order in. You can click straight through to my store from the boxes below. Next up is Kathryn, I wonder what she has made today as a goodbye to Sale-A-Bration?